Can you believe the New Year is just around the corner? I hope you all have been enjoying your holidays up to this point. I am kicking off 2015 with a new series on my recent trip to the Hawaiian Islands. About two years ago, we visited Australia and New Zealand with Bryan’s family. 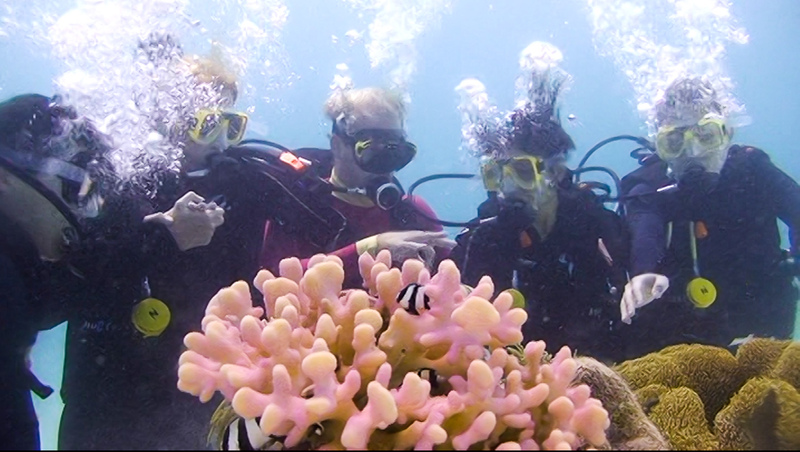 While visiting the world famous Great Barrier Reef, we signed up for an introductory dive. Basically, they teach you some really basic skills and then they allow you to dive with an instructor. Though I struggled a bit with getting used to putting my head underwater, Bryan had no fear and instantly fell in love with diving. Diving at the Great Barrier Reef in Australia. I’m the fourth person on the right. Bryan’s at the right. For Christmas following that trip, I gave Bryan a fully paid up SCUBA open water dive certification course. Life got busy, and things got in the way. We never found a good time to schedule the courses. And thus the certificate sat there . . . . for almost two years. Finally, about two months ago, we decided to take the plunge and finally get SCUBA certified. The plan? Book a trip to Hawaii and complete our open water dives there (the thought of diving in New England’s frigid waters during the winter just sounded a bit overwhelming). In one month, we completed all of our coursework and pool dives in Boston with East Coast Divers (excellent shop, by the way!). And then, right before Thanksgiving, we were off! Our time in Oahu was really, really short. People advise not trying to conquer too many islands into one trip. We were already trying to squeeze three islands into two weeks (not including Oahu), so Oahu was really more of a stopover location. We had a nice dinner in Honolulu and then spent the morning at the beach. As part of my #Totoro100Days series I decided to make a couple sand Totoros at Waikiki Beach. For brunch, we enjoyed a lovely Asian-Hawaiian fusion meal at a delightful cafe opened by a Top Chef finalist. Alas, our time in Oahu (which was way too short) had ended. Our 24-hour stay concluded with a wonderfully luxurious limousine ride to the airport courtesy of Blacklane, sort of an Uber for high-end cars (they match up local chauffeurs and cars with people looking for rides). It was fascinating (and a bit sad) to hear the life story of our driver. He was a pilot for Japan Airlines flying those huge 747 aircrafts for decades. During the recession of 2008, he lost his job. Not only that, he lost all his retirement benefits as a result of Japan Airlines’s bankruptcy filing. With pilot jobs being so scarce these days, he has instead switched to becoming a black car driver. Our first stop was Maui! We worked with the Maui Dive Shop (the largest diving outfit on the island) to get certified. In order to complete our open water certification, we spent two days doing four shore dives at Ulua Beach. Our instructor Jordan was great. She immediately put me at ease, which made getting certified so much easier and so much more fun. After two full mornings of dives we were official! The following day we did our first official dives as certified SCUBA open water divers. The first stop? St. Anthony’s Wreck, an intentionally sunken ship that has become an artificial reef teeming with life. It was magical to be in 60+ feet deep water, swimming around the wreck and among the sealife. We were supposed to visit Molokini Crater, the most popular dive site in Maui. Unfortunately, water conditions were rough and we had to skip it for another location. I learned that day that I get very, very seasick on dive boats. The ocean is very rocky! I threw up multiple times on the boat in between our two dives. Note to self: take seasickness medication. Taking Bonine the next time helped tremendously! The top two attractions in Maui are 1) seeing the sunrise at Haleakala and 2) driving the Road to Hana. Haleakala is a dormant volcano that reaches an elevation of greater than 10,000 feet. The scenery is stunning. Hiking above the clouds is spectacular. Alas, because we gone diving the previous day, we were not able to ascend to such a high elevation so soon after our dive (you don’t want to get decompression sickness, aka the bends). Instead, we opted to leave later in the day to hike and then catch sunset, which was still beautiful. We had bad luck with weather when attempting to drive the Road to Hana, a windy 50-mile journey through all different types of beautiful landscapes across the Northern coast of Maui. In fact, it was so rainy we ended up deciding to turn around before it got too dark. Maybe some other time . . . The Big Island is where I fell in love with the poke shack. There are so many of them, and they are all delicious. Yellowfin or ahi tuna is abundant and super fresh in Hawaii. They make all sorts of poke (raw tuna tossed in various types of sauces). Our first stop in the Big Island was lunch at a poke shack. Yum! With our newly minted SCUBA certificates, we signed up for the famous Manta Ray night dive with Big Island Divers in Kona, the west side of the island. It’s a surreal and otherworldly experience. You sit in the dark with dozens of other divers all shining flashlights up. The lights attract plankton, which attract smaller fish. The huge manta rays are then attracted to the smaller fish and they following, swimming really, REALLY close. You can see one swimming over a bunch of divers in the photo above. I have always loved turtles (I grew up with a pet box turtle who’s still alive today!) and had heard about the giant sea turtles, or honu, in Hawaii. I had been looking for them during all of our dives but had been pretty unlucky thus far. After finding out that Kahalu’u Beach Park had tons of turtles, we headed out there to snorkel. Diving was off limits because we had to be at higher elevation later that day. After searching around for 45 minutes or so, we finally found a turtle! Bryan took some great photos with his underwater-protected camera of me swimming with the turtles. Hee hee, it totally made my day. The next afternoon, we drove through the coffee towns in Kona (and picked up some delicious Greenwell Farms kona coffee) on the way to Hawaii Volcano National Park on the more eastern side of the island. The park contains Mt. Kilauea, an active volcano which has been erupting since 1983. The volcano looks especially cool at night. Although they don’t let you get too close to the active volcano (for obvious reasons! ), you can still hike many of the surrounding areas, including the remains from earlier eruptions. If you only have time for one hike, I would highly recommend the Kilauea Iki Trail, a 2-3 hour hike which takes you down through rainforests into one of these old lava craters and then back out around the rim of the crater. I found it absolutely fascinating to hike through an old lava crater. You can still see the humps from the cooled but once bubbling magma. In fact, at certain points there’s still steam coming up from underneath the earth through various crevices in the crater. We also did a bunch of other hikes and drives in the area, but this one was my favorite. Our last stop was Kauai, where we started out with a private helicopter ride from Mauna Loa Helicopter Tours. Neither of us had ever been in a helicopter before, so it was completely new. We actually opted to do the helicopter ride with the DOORS OFF! It was windy, but the photos came out great (no glare!) and the experience was unforgettable. Flying through the valley of two grass covered mountains in the center of the island, near Mt. Waialeale, the wettest spot on earth. One of the most beautiful coastlines in the world – the famous Na Pali Coastline. Bryan was still itching to dive, so we booked a last minute shore dive with Bubbles Below Scuba, which offered a “rent a buddy” type service which worked out great for us. As novice divers, we still felt more comfortable going with a guide. Though our schedules could not fit in a boat dive, we were able to squeeze in a late afternoon shore dive by hiring a guide to bring all our rental equipment and also to come with us on the dives. The best part is that we could pick the starting time and the guide just met us at Koloa Landing, a convenient 2 minute drive from our hotel in Poipu. Thanks to our excellent guide, we found soooooo many turtles! It was by far the most turtles I had ever seen in one place. It was fascinating just watching them. We also saw an octopus, various types of eels, and lots of fish. 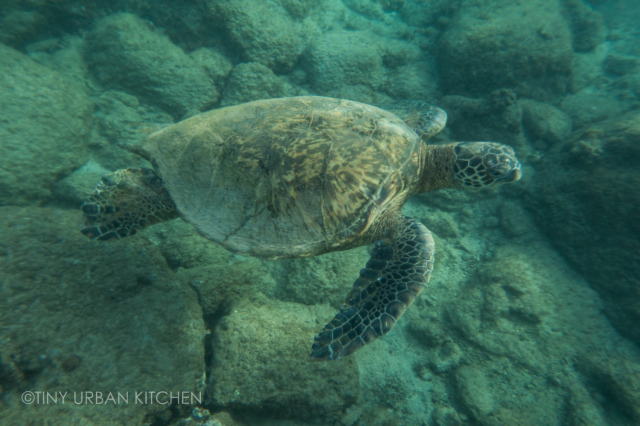 Although the coral reef in Kauai is not as pretty as what we saw in Maui, the wildlife was excellent and the turtle count was out of this world. Our last day in Kauai, we decided to hike part of the famous Na Pali coastline. Like many people, we chose to hike 2 miles of the Kalalau Trail and then 2 more miles to the 300 foot tall Hanakapi’ai Falls. The roundtrip of the entire hike would be 8 miles through dirt paths, slippery rocks, and across wet rivers. We hike through sunshine, rain, and lots of mud! The hike turned out to be much more challenging than I had expected. Although the elevation gains and descents weren’t too bad (we would climb and descend less than 1000 feet each time), the terrain was quite challenging! At time it would be super muddy; at other times there would be steep, wet, and slippery rocks we would have to climb or descend (see above photo! ); and at other times, we had to cross rivers either by stepping on (wet) stones or walking straight through the water. Needless to say, we got really dirty! But we finally made it! The hike back was slightly stressful because we knew we were scrambling to get back before sundown and we were cutting it close. The hike out to the waterfall took A LOT longer than we had expected. Thankfully, we made it back right when the sun was setting. In fact, we got to see stunning sunsets and rainbows from the trail as we returned. All in all it was a phenomenal trip and I think we both fell in love with Hawaii. I immediately started missing it the moment we landed in Boston. It was overly ambitious to squeeze in three islands in two weeks, and I felt like we barely scratched the surface of each one. There are still so many hikes, dives, and beaches to explore. The vast variety of landscapes is mind-blowing. Stay tuned as I loop back to each of the islands and share with you some of the great food we enjoyed! UPDATE: Links to all posts in the series! Disclaimer – the black car rides to and from the airport in Honolulu were graciously provided by Blacklane Cars. We completely paid for all other services mentioned in this post. All opinions are my own. Sign of the Goat? Really? these are stunning pictures!! looks like so much fun! I so enjoy visiting the world with you. And as I get tremendously seasick/motion sick, I enjoyed seeing your water and helicopter adventures too. Well it looks like you guys packed in a lot! I can’t wait to hear more about the culinary adventures you had along the way. Your photos are beautiful! I went to Hawaii four years ago and have been wanting to return ever since. Hopefully some day soon!